Love falafel? 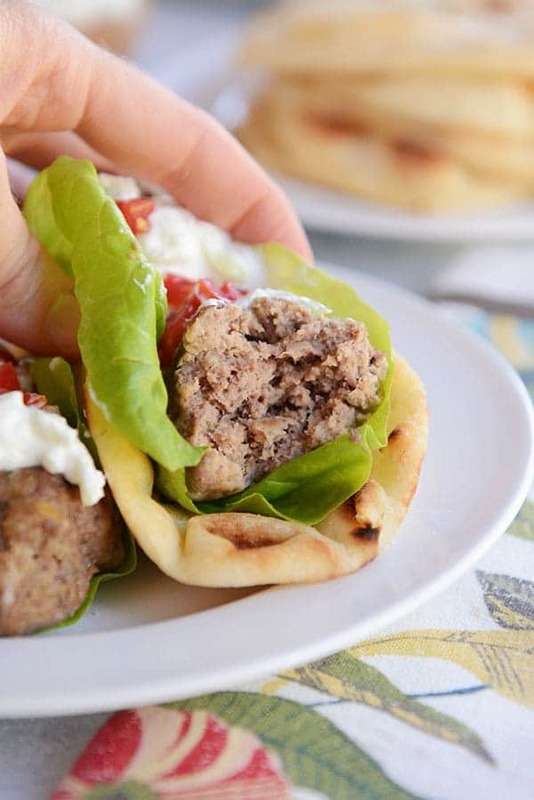 You’re going to love these falafel meatballs wrapped up in lettuce (and naan if you want!) and smothered in simple, homemade tzatziki sauce! It’s about time falafel became a meatball! I’m a lover of all food. I try not to play favorites. But when it comes to Greek-inspired cuisine, I usually end up waxing so poetic that everyone around me feels a bit awkward. “It’s just food” shows in their dazed expressions. Hard to be friends with people who think like that, not going to lie. 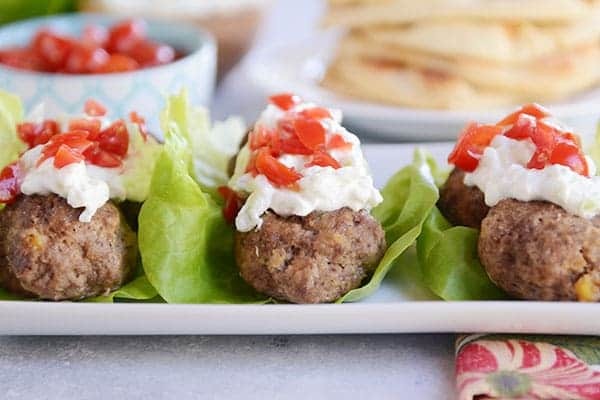 Today’s falafel (perhaps one of the more fun words to say in life) meatball recipe has shot straight to the top of the favorite list. They are so good. So, so good. Falafel purists are probably saying “what the what? ?” to today’s recipe, but I feel like there is room in this world for all different kinds of falafel. Classic falafel is a chickpea fritter fried in oil and usually stuffed in a pita. I’ve had the best falafel of my life at a food truck in Portland, Oregon. But generally I don’t make it at home, because I hate deep frying on my kitchen stove (unless it’s doughnuts, of course). …and now I can have a falafel meatball fusion at home. These babies are baked, not fried. And you get the delicious hints of nutty chickpeas and flavorful spices all wrapped up in a tender, juicy meatball. We serve these in lettuce wraps topped with tzatziki (my favorite of all sauces) and chopped tomatoes. But you could pull out the naan/flatbread (storebought: I really like Costco’s refrigerated stone-fried naan or homemade: classic naan or Greek flatbread) and nestle the lettuce-filled wraps inside. 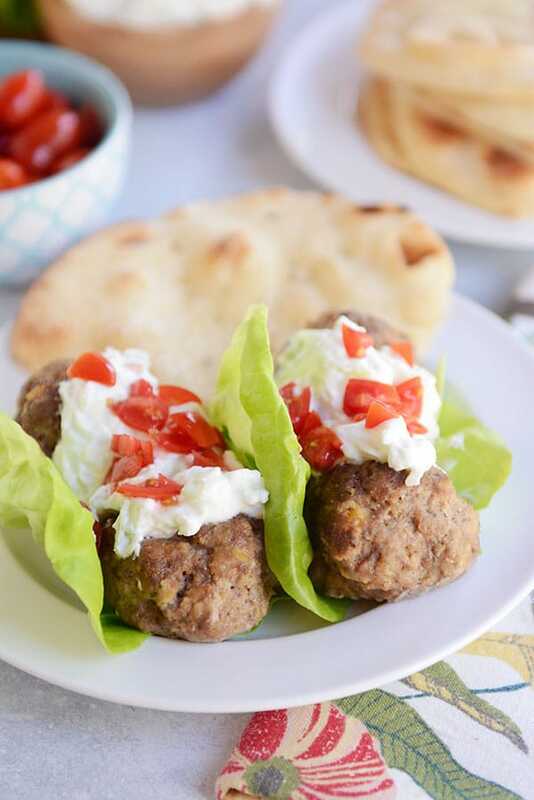 These Greek Meatball Stuffed Pitas (with tzatziki) are close to one of my favorite meals of all time, but I have to say, my newfound falafel meatballs are giving that meal a run for their money. Preheat the oven to 400 degrees F. Line a large, rimmed baking sheet with foil and lightly grease with cooking spray. For the meatballs, combine the chickpeas, parsley, egg, oregano, garlic, salt, and pepper in a blender or food processor and puree. Scrape the mixture into a medium bowl. Add the ground beef or turkey, grated onion, milk, panko or bread crumbs and lemon juice. Mix until combined (I find it's easiest to mix with my hands). Shape the mixture into about 16-18 meatballs (a little smaller than golf ball size). Place the meatballs on the prepared baking sheet about 1/2-inch apart. Bake for 15-20 minutes until cooked through. For the tzatziki sauce, in a medium bowl, stir together the yogurt, cucumber, feta cheese, garlic, lemon juice, salt and pepper until combined. Drizzle with a bit of olive oil. Refrigerate until ready to use. 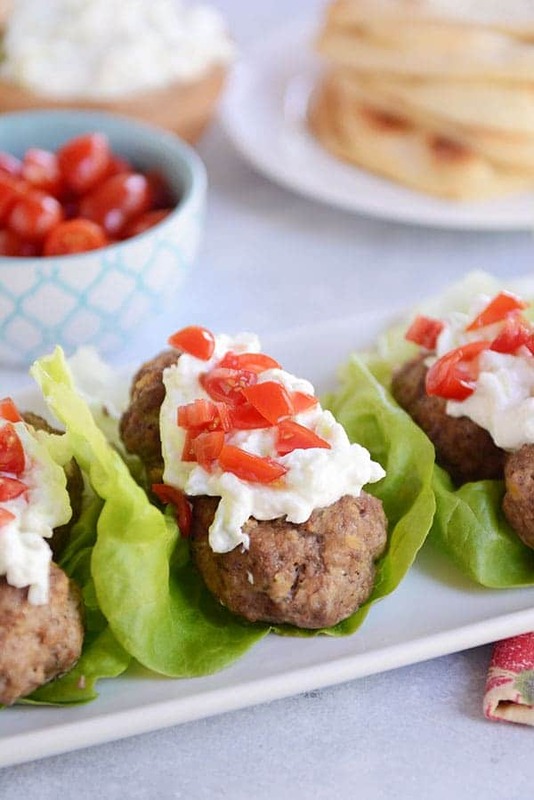 To serve, place 2-3 meatballs on a lettuce leaf, dollop with tzatziki and top with chopped tomatoes. The lettuce wrap can also be served inside naan bread (or serve the naan on the side), if desired. Not all ground turkey is created equal. I've found the kind in the tubes is pretty icky (super mushy - I know, gross), and the meatballs might have a tendency to fall apart. If using ground turkey, mix together all the ingredients EXCEPT milk and only add the milk if the mixture is really thick and stiff. I usually use the butterball brand (at Costco) or Jennie-O, but mostly I use lean ground beef because I like the flavor a bit better. I made this recipe this week. The falafel meatballs were amazing! It made a TON for two people, so I threw them in the freezer and my husband and I have slowly been enjoying them. They have a great texture and honestly, I could get away with making these with spaghetti and get double the meatballs for the amount of ground beef I buy! I brought it for lunch over rice so I had something warm to eat and threw the tzatziki sauce and diced tomatoes on top and it was delicious. Highly recommend. I love this recipe! In fact I have a comment below! I just wanted to let you know I had a heck of time finding this recipe. Just fyi. I am going to bookmark it since I’ll forget how I found it. Thanks for letting me know! I’ll try to get it categorized to find more easily! Thus looks fabulous and I have ground turkey from Costco :). I also have dried falafel mix in the cupboard- can I sub that for chickeas etc? I’m not sure but it’s probably worth experimenting! Can you share the name and/or location of the food truck in Portland with the amazing falafel? I live near Portland and would love to give them a try! Thank you! I wish I could remember, Victoria! It’s been several years and I honestly can’t remember the name. I’m so sorry! Almost everything I have made from your blog has been great. Luv, luv, luv, your indian butter chicken! I am going to make your broccoli soup w/ whole cream- it always separates when I make it with milk- my Mel fail fault because I forget I’m cooking sometimes!! I made this 1:1 lb. ground beef/ gr. Turkey but added coriander, cumen, cardemon, cayene pepper, parsley and cilantro for a more middle east taste . I like a lot of flavor (Jerusalem cookbook by Yotam Ottolenghi) Whole family loved them. So much easier making in the oven. Plus, lot’s of protein! These were really good and had a great falafel taste without feeling heavy. Baking is the way to go, what a good idea. We ate these on your homemade flatbread recipe with chopped tomatoes and romaine. I’ve never put feta directly in tzatziki sauce but I think my kids ate more than when the cheese is separate from the sauce, so it was a win. I missed the note about the milk with the ground turkey. My meatballs spread a bit as a result but I didn’t have any issues handling the “dough.” Overall, this was a winner for us! Made these shortly after you posted the recipe and they were fantastic. SO TENDER! I made them with ground turkey. (Love how the chickpeas upped the protein content!) I’m going to make them for Thanksgiving dinner this weekend (I live in Canada). Just wondering if you have any suggestions about serving them in a sauce, vs. with the tzatziki. I love the tzatziki but was thinking maybe it would be easier for a crowd to just sauce them? Not sure what flavour of sauce to go with though… Thanks Mel! Happy early Thanksgiving! I actually think these meatballs would be pretty versatile with sauce. They’d probably be quite delicious with a sweet and sour sauce (similar to these meatballs or even these Thai green curry meatballs). Mel in the house tonight! I made your falafel meatballs with the tzatziki sauce, homemade naan (I could have eaten all 12 of them!) and for dessert – your zucchini brownies! All were a hit and so delicious – thank you for sharing these fabulous recipes! Haha, you made me laugh out loud, Patricia, with your opening line. 🙂 What a FABULOUS menu tonight! So happy all the recipes were a hit! These were delicious! Thank you, Mel! I know keeping this website running is so much work, but you really do have a positive impact on my family. We got home late tonight and this was on the schedule to make. I halved the recipe and used my (new) air fryer for the meatballs. Loved IT! I used left over Naan bread (your recipe). So good together. Came together pretty quick and much better than stopping on the way home for some fast food. Yum! I’m intrigued by air fryers but haven’t used one before! Mel, I have no words for how amazing these meatball taste!!! I have made them twice since you posted the recipe and they will be in regular rotation! Thank you again for another great recipe! This basically means you and I are soul sisters, because this is one of my favorite meatball (meal??) recipes ever! Yeah, these rock. The leftovers even better, once the tzaziki had a whole day to meld together. Amazing!! 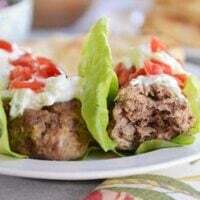 Love the lettuce wrap idea- geniously delicious! I like to eat meatballs, but don’t like to make them! However, I love middle eastern food and anything with tzaziki sauce 🙂 SO, I made your tzaziki (leaving out the feta, because Hubby doesn’t care for it), then I made a basic hummus (without tahini, because I didn’t have it on hand). Then I sauteed onions, garlic and 1 lb. of ground beef (wish I had some lamb to add…) and added 2 tsp cumin, 1 tsp coriander, 1/4 tsp cayenne, 1/4 tsp cardamom. Served it as a lettuce wrap: laid down some hummus, topped that with the meat, then the tzaziki. Next time I’ll sprinkle some feta on mine AND remember the chopped tomato AND double the recipe!! I want more leftovers!! Thanks for the inspiration, Mel! I made these tonight and my husband and I thought the flavor was just awesome. Question for you though: did you purposely grind up/smush the chick peas? I just mixed them (whole) in the meatballs and while they didn’t take away from the taste, they made the meatballs look a little funky and not as pretty as yours. I don’t really care about the esthetic, but am just curious if I missed a step. Thanks! Hey Megan – I think I might be a little confused about what you are asking…but I do puree the chickpea mixture (the first part of step #2). Is that what you are wondering? Oh wow, I definitely missed the puree part and just did everything with my hands! How did I miss that? Thank you! I was super excited to make these, since my husband loves middle eastern/Mediterranean food. The tsazaki sauce was amazing, definitely 5 stars. The meatballs…. not sure where I went wrong, but they lacked flavor and were somewhat bland to me. I also tried the homemade pita recipe link, for the third time. I’ve never had it turn out for me. Only two pitas “puffed.” Oh well. The family still enjoyed it, thanks! Sorry these weren’t a home run for you! I made these for dinner tonight, and they were excellent! The chickpea and ground beef combination made the most tender of meatballs. There were no complaints from my picky teenager either. That is something! Mel, I made these tonight and they were amazing! My kids ( and a friends kids) all had 2 servings! I only used 1lb of ground beef ( we buy a half cow at a time and its packaged in 1lb bags) and I thought the combo was excellent! Thanks so much for another east recipe! One question- if you were going to freeze these, would you bake then freeze or just roll out and bake when defrosted out of the freezer? I’m so happy you loved these, Jessica! If it were me, I’d totally bake and then freeze to make it super easy when you want to eat ’em. I would a falafel recipe… I have a restaurant that I love them at and I have a hard time finding a good healthy for awful recipe online could you help a sister out ??? This was really good!! Made with ground beef. My husband loves falafel, and we hardly ever have it, so he was in 7th heaven, I only made the meatballs because my grocery store just started stocking tzaziki and I’m lazy :), but I also made your flatbread recipe which is a tried and true favorite around here. The only thing I noticed was that I ended up with 36 meatballs (using my medium size scoop, about the size of a golf ball). Not sure why! But I’m not complaining – plenty in the freezer for next time! Thank you!! Thanks for the review, Kristen! Glad you liked them! Yes! Tzatziki sauce! Miss my summer spent in Greece! Everything in your photos looks so delicious! Yummy! Made them last night for dinner with ground chicken and omitted the milk. They baked perfectly. Even our soon to be 17-year-old was oohing and awwing (and he’s picky). Thanks for making dinner a no-brainer for me. Yum! Yum!! So happy you loved them – thanks for the report back! I’m with you! I love me some Greek! These look so declicious! Thank you! I apologize in advance for being nitpicky. Though they’re on the menus of nearly every Greek restaurant in the U.S., pita, pita salad, falafel as well as hummus and baba ganoush aren’t Greek. They’re Lebanese/Middle Eastern. Thanks, Sally! That’s actually a really great point. I tend to group this dish as a whole into the Greek-inspired fare mostly because of the added Greek flatbread and tzatziki sauce. So it’s probably better classified as a fusion dish, but you make a great point about falafel’s origins. Thank you! I live in Portland (actually Happy Valley, a suburb of Portland) and would love to try the falafel you’re talking about. We’ve found food trucks to be hit or miss and really want to find a solid hit! Could you share the name of the food truck and/or the location where it usually parks? Thanks in advance! What I DO have is a quart of Greek Yogurt handy, because I’d needed a few Tablespoons the other day for a Greek chicken marinade, and went to 3 stores without being able to find a 6 oz or 8 oz container of it! That happens frequently around here, so I’ve got a lot of Greek yogurt needing to be used, and was very excited to get this recipe today! The only other things that had so far occurred to me were a Persian chicken, rice & saffron dish that contains a quantity of yogurt in it, and a yellow cake that is made with yogurt. A 3rd use for it really puts me on a roll to using it up, and just when I’d needed it! Thanks, Mel. Is the Tzatziki sauce on this recipe your current Tzatziki favorite, or do you tend to use different Tzatziki variations specific to certain recipes? This tzatziki sauce is really close to the “master recipe” I use for almost every tzatziki batch I make, except it has added feta cheese, which is super tasty! Thanks for another meatball recipe! I could eat turkey meatballs every day. And you have the BEST recipes for them!! 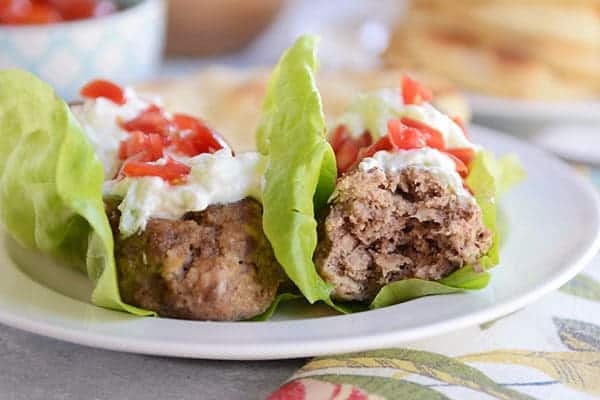 These look delicious, and I love that you made them with lettuce wraps! I fell in love with falafel when I lived in Los Angeles. Not much availability here in northwest Montana …. BUT, I do make it occasionally. I have had some success spritzing the fritter-balls with olive oil and baking in a mini-muffin pan so they kind of fry but frying is really best. I do it outside! The real key though is not using canned beans or cooked beans … you only soak the chickpeas (see Tori Avey). This recipe is on my list. I’ll report back at some point but I plan on a beef-lamb mix and a bit less meat to bean ratio (less meat-more beans). I often mix beans with ground meat and it works really well. This is a combo I never thought of and perfect for a falafel-like meatball. Thanks, Mel! Great tip about the mini muffin tin and spritz of oil, Liz! I think the beef-lamb mix would be spectacular!